Hon'ble Governor of Maharashtra and Chancellor of Universities in the State, Ch Vidyasagar Rao (right) along with Minister for Higher & Technical and Medical Education Vinod Tawde (left), conferring the Honorary D Litt (Honoris Causa) on Dr. Cyrus Poonawalla. 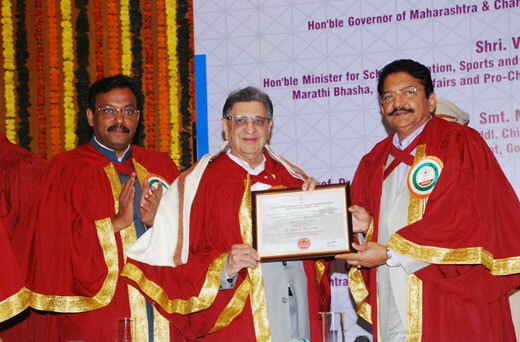 The Governor of Maharashtra and Chancellor of Universities in the State, Ch Vidyasagar Rao, conferred the Honorary D Litt (Honoris Causa) on the Chairman and Managing Director of Serum Institute of India Dr. Cyrus Poonawalla for his contributions to public health by manufacturing low cost vaccines. The Minister for Higher & Technical and Medical Education Vinod Tawde, Additional Chief Secretary Medha Gadgil and Vice Chancellor of the Maharashtra University of Health Sciences Arun Jamkar were present at the Convocation ceremony held at Sahyadri State Guest House in Mumbai on 4th March 2015. Poonawalla said immunisation is key to prevention of many diseases. He said a large number of children in the world die for want of immunisation. Lamenting that India has among the lowest rates of immunisation, which is lower than Bangladesh, Nepal and some Sub-Saharan countries, he called for efforts to make sure that no child is deprived of immunisation.